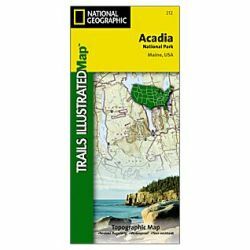 Trails Illustrated Map - Acadia National Park & Mount Desert Island, revised 2002. Waterproof, tearproof topo map, one of the excellent series produced by National Geographic Maps. Main map of Mount Desert Island has 25-foot contours, at 1:35,000 scale, shows all trails and carriage roads. Also has overview map of Acadia area at 1:100,000 scale. Also has introductory info and trail lists and highlights. Folded to 4 ¼” x 9 ¼”.